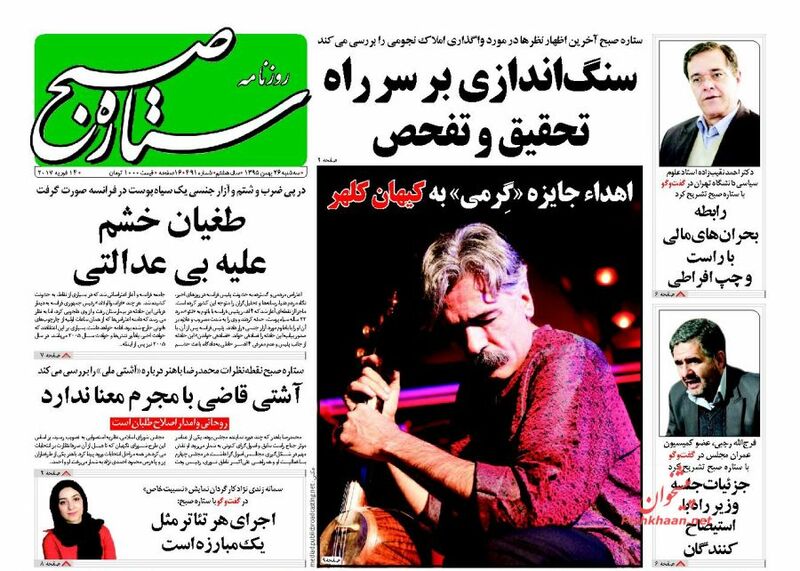 IFP has taken a look at the front pages of Iranian newspapers on Tuesday and picked headlines from 24 of them. IFP has simply translated the headlines and does not vouch for their accuracy. Several newspapers covered the controversy sparked by the presence of a number of Iranian ministers and officials in a ceremony in Swedish ambassador’s house in Tehran and the deals signed during the ceremony. They also covered the ongoing crisis in Iran’s southwestern province Khuzestan, particularly the dust pollution and its harmful effects on citizens. The new oil reserves discovered in Iran and the snow and rain that have hit several Iranian provinces were among other top stories today. 2- A Look at Flynn’s Scandal: Will He Become a Shield for Trump?